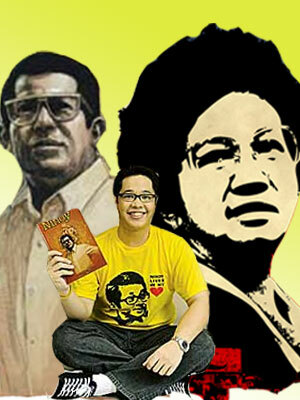 On being Cory and Ninoy Aquino’s grandson. Honestly, I find carrying the name more of a gift than a curse. I’m glad to know I’m blessed with it. Living up to it is constant challenge. You have to protect it always. I understand that I have big shoes to fill. Hindi naman nila ako pine-pressure, I can still do this and that pero suwerte na rin ako kasi good guy ako basically. On preserving his Lolo’s legacy. Hindi ko na inabot si Lolo Ninoy. I knew of him through the stories about him that I’ve read and the recollections shared to me by my family. He stood up freedom and died for our independence. It’s sad most seem to have forgotten what happened in Edsa—the spirit of People Power and what it represents! To honor him on the 25th Anniversary of his death, I published a book, Ninoy, which showcased 25 moments in my Lolo’s life. The artworks were drawn by 25 Filipino comic book artists. Tapos may 25 essays written by different people. I managed its publication. I wanted it out for the youth, na makilala nila yung lolo ko. On his favorite memory with Lola Cory. Sabihin ko na lang na she was always present sa lahat ng graduation ko. Mula grade school to high school and then college, she was there. Kapag tapos na ako tawagin, okay na. On taking up the cause dear to her Lola. My Lola was very much into micro-finance. I like to know more about it. Right now, I do my part by being a good citizen. I’m really amazed at my grandparents’ level of love for the country. To them, it’s God first, the country second, and the family third as far as life’s priorities are concerned. I still don’t get why third lang ang family, but I really want to understand. My Lola would always tell me, “When you go to heaven, hindi naman tatanungin ni St. Peter kung ano yung grade mo sa math.” What matters is how you lived, how good a person were you during your stay [on earth]. Her best advice is just to be a good person.